In August, the U.S. economy created a weaker-than-expected 173,000 jobs while the official unemployment rate dipped to 5.1 percent from 5.3 percent the previous month. Economists had expected a 220,000 increase in new jobs. On Friday, the Dow Jones Industrial Average fell 272.38 points, or 1.7 percent, as investors remain concerned about the health of the U.S. economy amid last month’s global selloff. 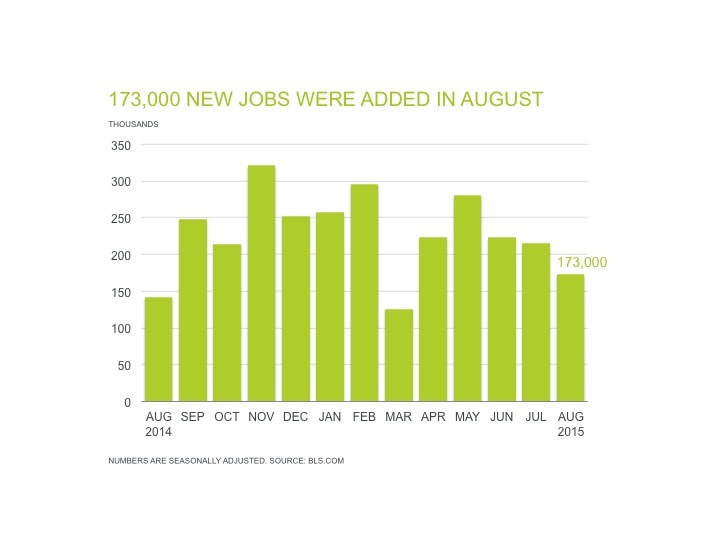 Jobs in manufacturing decreased by 17,000 in August, after posting gains (+12,000) in July. “Employment in professional and business services continued to trend up in August (+33,000) and has increased by 641,000 over the year,” according to BLS’s Sept. 4 report. The jobless rate of 5.1 percent is fueling speculation that the Federal Reserve may increase interest rates for the first time since 2006. The Feds will hold a closely scrutinized policy meeting on Sept. 16 and 17. The labor participation rate provides a somber reminder of the record 94 million Americans who were jobless for the month of August—261,000 more than July. At 62.6 percent, the labor force participation rate remains at a historic 38-year low. Government workers can also expect a pay increase after the turn of the calendar year. Federal employees are on track for a 1.3 percent pay raise in January, unless Congress blocks such a move by President Obama.